Some background first: South Africa's power market is utterly dominated by (a) coal and (b) Eskom, the parasitical parastatal monopoly. In a bid to encourage both fuel diversification and competition, the government has determined that 3,725 MW of new capacity up until 2030 should consist of renewable sources operated by independent power producers (IPPs). This translates to roughly 10,000 GWh of actual future electricity generation. Ignoring the fact that this is small potatoes in the scheme of things \(-\) less than 5% of the country's current 240 TWh annual electricity consumption \(-\) the point that I want to make here is mostly about how those IPPs are chosen. Having played with various schemes, authorities eventually settled on something called the Renewable Energy Independent Power Producer Procurement Programme (REIPPPP). This is effectively a competitive bidding process, whereby applicants submit a guaranteed price that they are willing to accept for electricity that they generate in the future. In other words, it looks a lot like the idealised auction market advocated in economic textbooks. The six successful solar PV bidders, which shared an allocation of 435 MW, were particularly aggressive with their pricing. 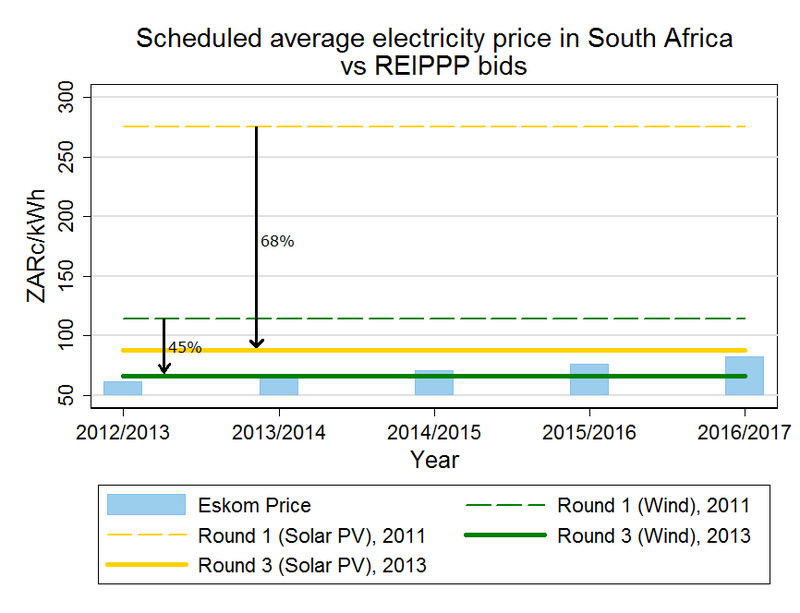 Fully indexed prices using April 2011 as the base year showed that the average solar PV price fell from R2.75/kWh in bid-window one to 88c/kWh in the third round. [...]Prices for the two 100-MW-apiece CSP [concentrated solar power] projects declined from R2.68/kWh in the first window to R1.46/kWh. Even then, just because a small portion of wind or solar energy is expected to "reach grid parity" within the next five years, doesn't mean that the game is up for fossil fuels. There are major problems with peak balancing, intermittency and load-following constraints that renewables need to overcome, which I and many others have discussed at length before. However, a 68% drop in the bid price of solar PV since 2011 \(-\) say nothing of wind and CSP bids falling by nearly 45% \(-\) is clearly impressive. Many people will see this as a evidence of how quickly renewable technologies are progressing. I wouldn't dispute that, but I also see it as a vindication of the auction system that was used for determining the winning bids. It is something that South Africa's electricity sector could use a lot more of. Why economists love auctions was published on November 06, 2013 .